Flow State allows humans to make positive behavioral change. …An all-inclusive, integrative event of movement, music, play and performances in the beautiful temperate rainforests of western Washington State. We come together for three days of exploration. Exploration of the body, mind and soul. We come together to connect and honor ourselves and one another. Movement and self-development specialists join us from around the world to share their knowledge and practices with you! They will help us rediscover the wonder and joy of movement, the breath, the mind. You may learn how to tap into your inner warrior, goddess, child. Performers bring us compelling stories with dance, acrobatics, fire and flow arts. Local DJs and musicians create energetic spaces for us to tap into our own rhythm, our flow, our self-expression. You bring your uniqueness, your interests, your skills, and your friends! Flow State Summit is a place for learning, exploring, getting curious and connecting with others. Summer Huntington loves everything Flow State. She founded the Flow Shala - unconventional training with a purpose featuring Steel Mace & RAD Roller self myofascial release tools. She directs and produces online fitness courses integrating ancient tools & modern wisdom (click link below). Summer has traveled to teach seminars for the past 6 years, and is shifting her focus on her local community integrating Flow and Corporate Wellness, as well as facilitating the second annual Flow State Summit. Mark is passionate about coaching fitness and circular strength training. He is always finding new ways to apply his knowledge of training science. Mark’s passion for design and aesthetic beauty is evident in the results of his coaching of tactical fitness, aerial fabric, physical combat, and sword fighting. Mark is based out of Los Angeles, California. His main client base is professional athletes and the Hollywood elite. Mark has been contracted to travel around the world and train some of Hollywood biggest stars for various A list movies. Aaron Alexander CR, LMT is an accomplished manual therapist and movement coach with over 13 years of professional experience. He is the founder of Align Therapy™, an integrated approach to functional movement and self-care that has helped thousands of people out of pain and into health. He hosts the top-rated Align Podcast featuring the biggest names in movement and wellness. Aaron’s clients include Hollywood celebrities, Olympic/professional athletes and everyone in between. He teaches world-wide and resides in Venice, CA. 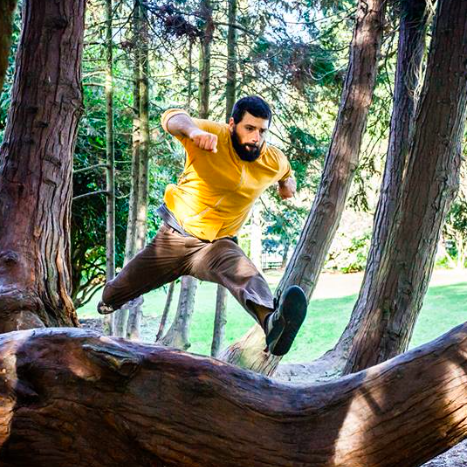 Rafe teaches people to move like a human, to reclaim your capacity to move with flow over grass, rocks, and trees, play with sticks and stones, and learn to develop yourself through contact, roughhousing, dance and combatives. Reconnect with nature and develop your aliveness in movement to become more resilient embodied human. Rafe’s students have included world class parkour athletes and MMA fighters, and untrained grandmothers, and the common theme in their responses to his approach is that is life changing on many levels. 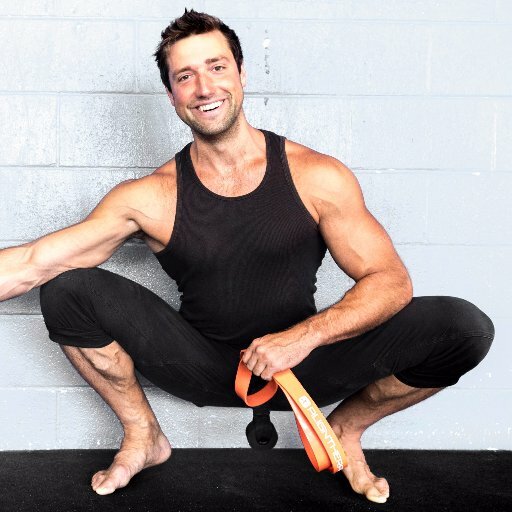 Meet Aaron Alexander, Manual therapist and movement coach to influential people of all sorts, writer, podcast host, disruptor of common ideas. Featuring a special video by Aaron on how to sit with proper posture! Thanks Aaron for coming to share your expertise at Flow State Summit 2019! Alice Bracegirdle gives it to us short and sweet, she is the founder of a global fitness movement, Bellyfit® which empowers women to love their bellies and bodies while shaking and shimmying! Music and Movement! What More Do You Need to Get Lifted? 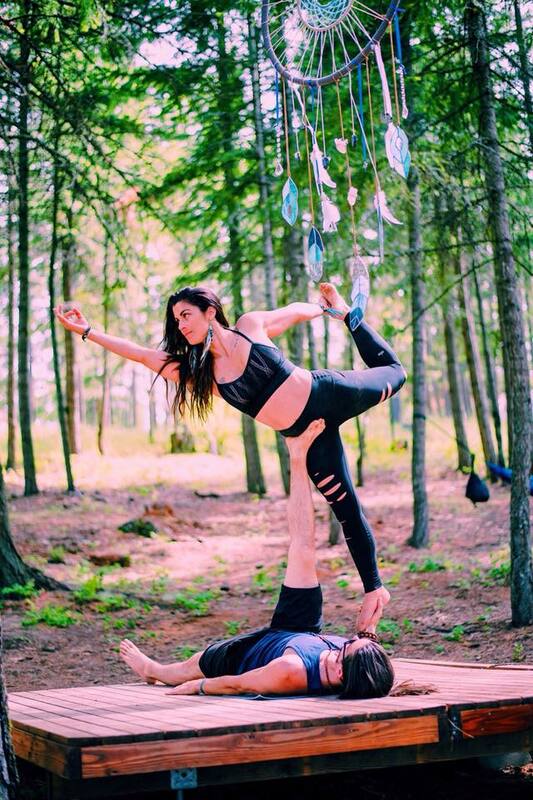 Yoga + Dj duo “Gravity Lift”, comprised of Antonella and Jordan will be uplifting spirits at F.S.S 2019! Meet this intuitive couple, sure to make you float right into your skin under the hot summer sun, this July! A completely beautiful and honest discussion with Luke and Miku who teach Compassionate Communication. These shining individuals study intentional communities and communication. An absolute wonderful read we can’t wait to attend their workshop at the Flow State Summit. Camellia Nieh is a dancer, acro yoga enthusiast, and performer living at the Lookout Arts Quarry (where Flow State Summit takes place!). Find out more about why we are stoked to have her perform and teach for the second year at Flow State Summit! 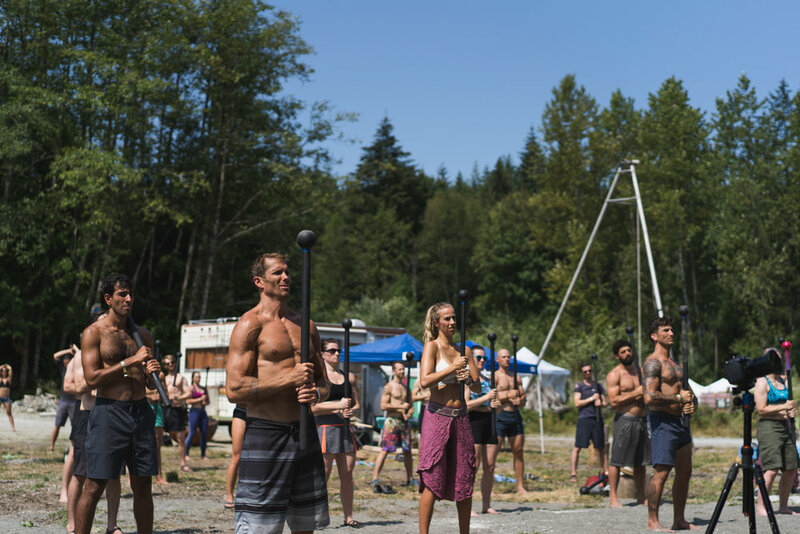 Cryo Warrior Ben Pelton, who led Wim Hof workshops every morning at FSS ‘18, talks about his life hacks, the benefits of cold plunging, and how he views being in flow versus fear. Explore how he integrates philosophy in his understanding of the mind/ body connection. We look forward to having him back for Flow State Summit 2019! Founder Summer Huntington shares about the real vision behind the Flow State Summit, the local production team and the vision for next year. Get to know what Flow means to her, and other life hacks to keep you sane out there. Fostering an environment of unity, and creativity among the masses isn’t the only thing Jenn is interested in. This long-time radio producer and recently turned DJ talks about what she aims for her set to be, how Flow can be a regular commitment in your life, and what importance checking in with like minded individuals can hold in a time like ours. ShadowVariable shares his views on what training modalities he sees emerging in the future, how Flow equals productivity, and exactly why he is so excited to be performing a set at the first annual Flow State Summit. Prepare to fully step into Flow and rewild yourself at the Lookout Arts Quarry - a space that exists to create art & performance. Sauna & clothing optional swimming area. 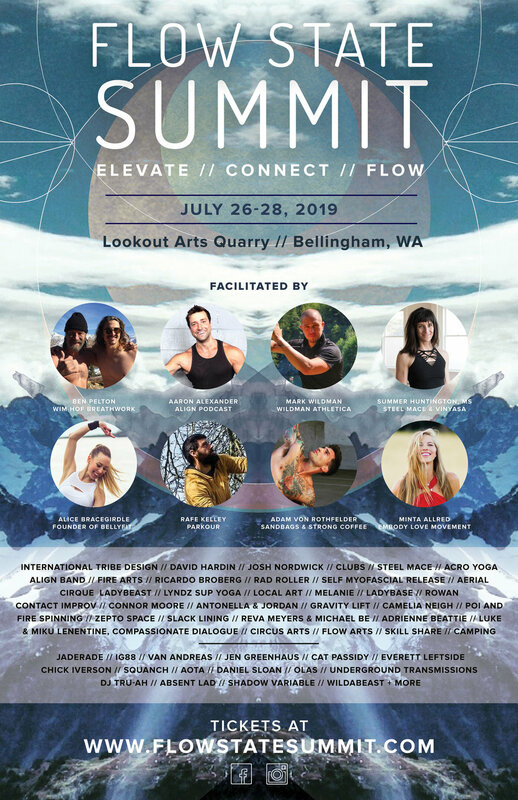 Flow State Summit is about cultivating an experience on a somatic level, creating meaningful connections and embodying flow in all aspects. 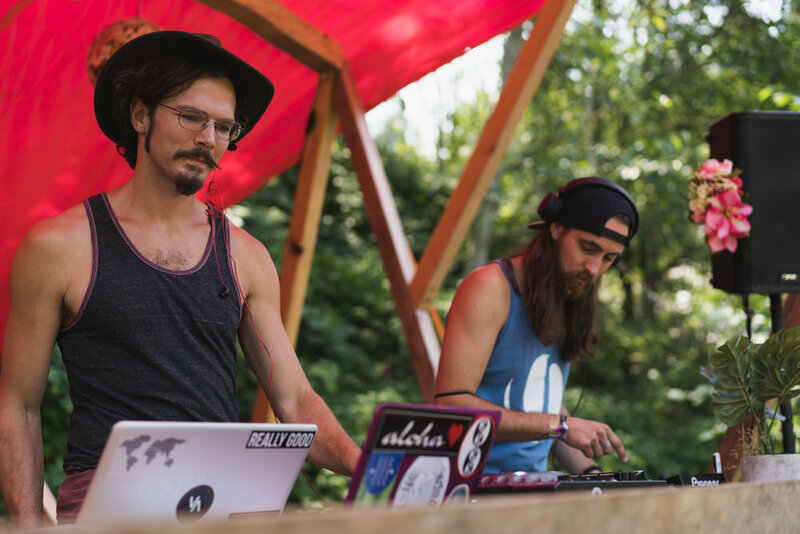 From camping in the woods, community breakfasts at the outdoor kitchen, morning yoga jams on the floating dock, workshops all day transitioning to ecstatic dance parties by night… you will be moved. The Flow State Summit is founded on radical inclusion, personal leadership, radical self expression and ‘positive psychology’ principles of Flow State that are as old as time. "When we step into FlowState, action and awareness merge and we become completely present. We loose self consciousness and our fear of being wrong, and we can reconnect with sacred creativity. " In Flow State, we make choices that serve our highest truth, and help heal the planet. Each headlining workshop leader, visual artist, performer, music artist is aligned with this message of healing the planet and healing ourselves. Get ready for a full immersive experience in Flow. Stay in touch about all events and monthly FREE video tutorials from our Ambassador team to elevate your stoke. Get reminded about VIP pricing dates & more! We respect your privacy, this is only good content coming to you my friend.